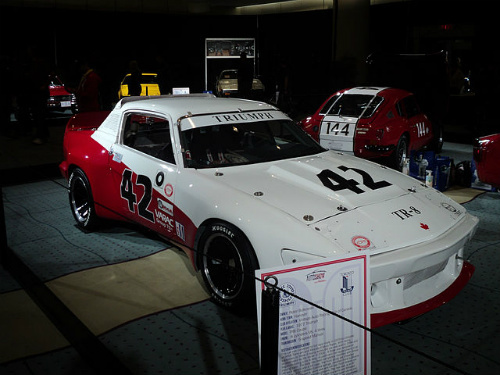 The Triumph TR8 sports car. In 1974, the original design concept for the TR8 was for a fixed head coupe version, and using the Rover 3.5 litre V8 engine. In 1975, the TR7 was launched, and soon after, US dealers were saying that demand was for the V8 version. In fact, the TR8 was the car that should have been launched instead of the TR7, since it was designed with the Rover 3.5 litre V8 engine from the outset. Unfortunately, it appeared too late, was aimed at the US market only, and by the time it was getting established, it was axed. In 1977, the US unexpectedly changed their stance on the illegality of open top cars. This was the green light for Triumph to present the US market with a TR8 convertible using a V8 engine. Triumph decided not to use its own 3 litre, single overhead cam, fuel injected V8 engine which was powering the Triumph Stag, due to its weight and service history. 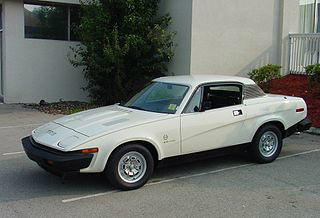 In 1978, the Triumph TR8 was finally launched onto the US market. It used the Rover 3.5 litre, 16-valve, single overhead cam, V8 engine, with a compression ratio of 8.1:1. In deference to US emission regulations, it was fitted with two Stromberg carburettors. 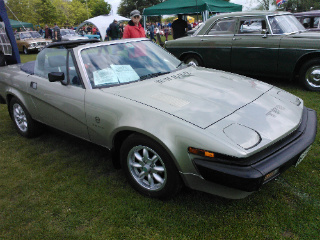 It was also known as the TR7V8, referring to those TR7 British Leyland rally cars fitter with the Rover V8 engine. However, 400 of the 1980 TR8's sold in California, together with all the 1981 and 1982 models, featured a Bosch L-jetronic fuel injection system linked to a specially designed Lucas fuel injection computer. The TR8 was a two door, two seater convertible fitted with a five speed manual gearbox driving the rear wheels. As a result of its excellent performance, the TR8 was often described as the "English Corvette" since both it and the Stingray used a powerful V8 engine. From 1979, when the Michelotti redesigned TR8 convertible was introduced, all TR8's were built as convertibles. One respected motoring magazine referred to the TR8 as "nothing less than the reinvention of the sports car". Since all production of the TR8 was exported to the US and Canada, very few genuine TR8's can be found elsewhere. Between 1978 and 1980, it has been estimated that about 400 TR8's were built as fixed head coupes, and as such are very rare. It was not uncommon for a TR7 to be converted into a TR7V8 using the original Rover 3.5 litre V8 engine. Furthermore, in Australia, a well established conversion was to use the 4416 cc version of the Rover V8 engine. Production of both the TR7 and TR8 continued until late 1981, when it was finally halted as part of a product rationalisation by British Leyland. Despite the fact that so few TR8's were built (a figure of about 2,750 is widely accepted), their racing history is still to be commended. A 1978-81 Triumph TR8 in good condition would fetch around £8,000/$13,000, whilst an outstanding example would command around £15,000/$24,000.